US oil giant alleges irregularities in judgment that saw a $19bn fine imposed on them, but all residents of Ecuador’s Amazonian regions want is justice and compensation for their suffering. One of the longest and most high-profile conflicts ever between a sovereign state and a foreign oil company over environmental and social damage has entered a new phase this week, which could lead towards something of a conclusion in the not-too-distant future, although it is equally likely that whatever the outcome, the dispute will continue to rumble for a while longer yet. The stand-off between Ecuador and Chevron has lasted for years, stretching back beyond the US-based company’s acquisition of Texaco in 2001. Texaco stands accused of leaving widespread pollution and pools of toxic waste from its operations in Oriente province in the north-west Amazonian region of Ecuador, between 1972 and 1992. The first complaints came from residents of the area, many of whom were indigenous communities or of indigenous lineage, and who claimed that Texaco had damaged the surrounding environment by destroying areas of rainforest, polluting the rivers and soil by dumping toxic waste, and causing residents to fall ill and suffer much higher rates of diseases and health conditions such as cancer. The first complaints came in 1993, and forced Texaco to embark on a $40m clean-up operation after it was found responsible of dumping up to 18bn gallons of toxic wastewater and spilling millions more gallons of crude oil. However, the residents of Lago Agrio, the principal locality affected by the alleged actions of Texaco, claim that the company carried out just a small fraction of its clean-up responsibilities, and mainly covered up waste pits with soil. In several agreements in 1995 and 1998 with the Ecuadorean government, though, Texaco obtained a release from liability for the damages, and was thus supposedly free from obligations for any further clear-up work, the responsibility for which would pass on to the Ecuadorean state oil company Petroamazonas. However, local residents continued to fight their case, and in 2003 re-filed a class action lawsuit for up to $28bn in damages. By this stage, Texaco had merged with Chevron, who inherited all existing legal actions against Texaco when it took over the company. After several years of attempting to have the trial transferred from New York to Ecuador, this request was granted and so in May 2003 the lawsuit was filed in Lago Agrio. After years of legal wrangling, and nearly two decades after the initial legal complaints against Texaco, in February 2011 the Ecuadorean judge Nicolás Zambrano passed down a sentence ordering Chevron to pay out $8.6bn in damages to the 30,000 residents affected by the pollution. However, despite this figure subsequently being raised on appeal to $19bn to cover all environmental and health damages as well as legal costs, Chevron immediately cried foul, claiming that the decision had been “fraudulent” and that they would appeal. This brings us to the present. Chevron have maintained that the processes that led to the February 2011 ruling in Ecuador were tainted by fraud and bribery, as well as by the manipulation of statistics and scientific evidence. Furthermore, in September this year Chevron obtained a ruling from an arbitration panel at The Hague that reaffirmed the validity of the agreement between Texaco and the Ecuadorean government in 1998 that exonerated the oil company from any further financial responsibility for “collective damage”, although it left open the possibility that it could still be liable for damages from individuals. On 15 October, proceedings began in a case brought forward by Chevron to a court in New York claiming that the $19bn fine imposed on them by the Ecuadorean court in 2011 was fraudulent and based on falsified evidence. Over the course of the trial, Chevron’s prosecution team will present numerous witnesses who claim to have evidence of fraudulent activities on the part of the legal team, headed by US lawyer Steven Donzinger, representing the Lago Agrio residents. On the opening day of the trial, Randy Mastro, one of Chevron’s lawyers, argued that the 2011 verdict had been obtained by fraud, coercion, extortion, money laundering and bribery. Included among the witnesses is Alberto Guerra, a former Ecuadorean judge who has claimed that Donzinger and co. paid $1,000 a month to Zambrano to rule against Chevron and allow Donzinger’s team to ghostwrite the sentence before signing it himself; Donzinger has denied all these claims. On the other hand, one of the Donzinger team’s lawyers, Richard Friedman, told the New York court that his client had not committed any bribery or wrongdoing, and that he had simply worked to hold Chevron accountable for damages done to the Amazon rainforest. He compared Donzinger to US civil rights leaders such as Thurgood Marshall and Ralph Nader, and added that Donziger had merely taken up the cause of indigenous Ecuadoreans who had often been mistreated and discriminated against, and had successfully persuaded the Ecuadorean courts to hold Chevron responsible for its actions. The case is expected to last for between four to six weeks, but after 20 years of legal toing and froing, rulings and counterclaims, it is highly unlikely that the outcome of this particular phase of the battle will be decisive. 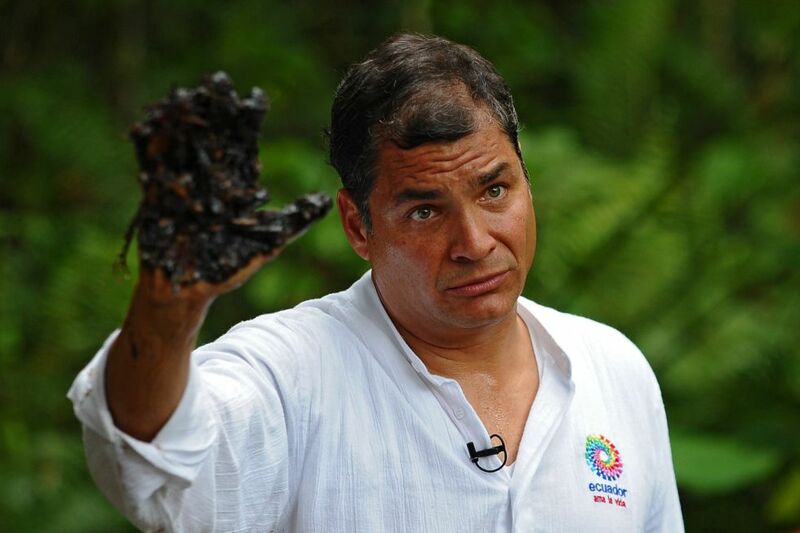 In the meantime, Ecuador’s President Rafael Correa, who has supported his country’s case against Chevron since assuming the presidency in 2007, has launched a new publicity campaign against the oil company, in which he and numerous officials and celebrities are invited to travel to the Amazonian region affected by the pollution, and visit one of the pools of crude oil allegedly left by Texaco. “The Dirty Hand of Chevron” (La Mano Sucia de Chevron), as the campaign is known, involves those invited dipping their hand into the pool and withdrawing it to show the oil and detritus that clings to their hands to the reporters and cameras watching. This was the case with Correa, who launched the campaign in September. After an article in the British magazine The Economist implied that the pool in question was one left by Petroamazonas, and not Chevron, Correa launched a scathing attack on the magazine and other doubters and invited them to visit the area, insisting it was Chevron who were “lying” and in denial about the damage they had caused. While the aim of the campaign itself is clear – to highlight the extent of the damage left by Chevron in the Ecuadorean Amazon – there is another factor which is likely behind the timing and scale of Correa’s “crusade” against the oil company. Correa’s recent decision to abandon Ecuador’s Yasuní-ITT Initiative, in which the country sought financial contributions from global society in exchange for keeping almost a billion barrels of crude oil underground in one of the most biodiverse spots on the planet, but which was cancelled in August after a lack of progress in gathering the necessary funds, has led to harsh criticism from environmentalists and former allies who consider Correa to have “sold out” on his green credentials in exchange for the short-term cash boost which the oil represents. In this sense, the stepping up of the campaign against Chevron and defence of the Amazon against malpractice by foreign oil companies can perhaps be seen as an attempt to win back some of the support which Correa may have lost. On the other hand, for some the Mano Sucia campaign only serves to prove Correa’s hypocrisy when it comes to oil exploration: blasting those who have exploited Amazon oil in the past while pressing on with his own government’s plans for expanding the oil frontier ever deeper into pristine Amazon rainforest. Furthermore, he is simultaneously attempting to lead a global boycott of Chevron and its products, while giving public backing to his political ally, President of Argentina Cristina Fernández de Kirchner, over her country’s recent billion-dollar deal with Chevron to develop Vaca Muerta, a shale oil and gas field in the west of the country. 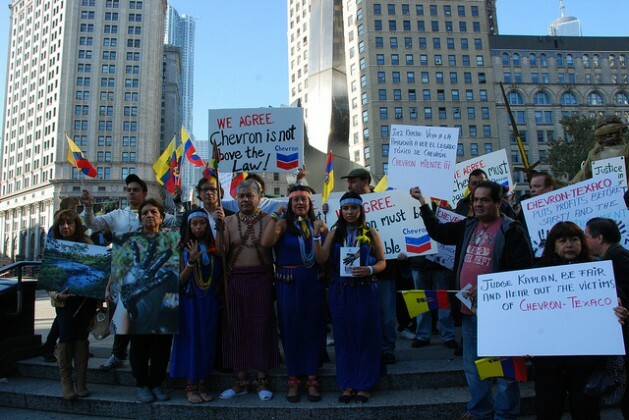 The eventual result of the legal battle between Chevron and Ecuador will likely have a significant impact, not only for the thousands of Ecuadorean residents whose lives and health have been affected by the pollution, but also for the implications for future disputes over environmental damages between oil companies and sovereign states. In an ironic twist, this could be taken to include a dispute in which the US finds itself on the other side of the argument: that of the Deepwater Horizon spill by BP in 2010, which President Barack Obama labelled the “environmental 9/11” and led to persistent efforts by the Obama administration to bring BP to account for the damage caused under their watch. Certainly, a positive result for Ecuador in its own case could have the effect of acting as a deterrent for oil companies in the future, ensuring that they take extra care to minimise environmental and social impacts from their activities. Correa, meanwhile, has said that ensuring that Chevron pays up and that the damage is compensated is a question of “national honour”. The idea of a relatively small developing country standing up to a global giant such as Chevron and winning has enormous implications for the future of global development, where developing countries such as Ecuador frequently feel that allowing the exploitation of their natural resources is essential for their progress, but opening the door to such activities can often have disastrous social and environmental consequences which can themselves act as impediments to those countries’ development. The NGO Amazon Watch runs a website/campaign called ChevronToxico, where you can find more information and news updates about the battle between Chevron and Ecuador.